This blog is a knowledge sharing and sometimes a "recommend me" kind of blog where I will evaluate, share, and recommend interesting tools, apps, gadgets etc. Disclaimer: The content of this blog is solely from my point of view, opinion and experiences. Your mileage may vary. I'm using a Latitude E7450 by Dell, running Windows 10. After playing around with some configuration tweaks, I started noticing some static pops or crackling noise on the speaker when playing sound. After searching around for some solutions, I found someone having similar problems and it seems to have something to do with the Sound settings. In the Properties page of the default Playback device, under the Advanced tab, there is a Default Format setting. I believe the default was set to CD Quality (16 bit, 44.1kHz). I've set it to the highest setting (24 bit, 192kHz) and it seemed to have caused the problem. I verified that this is the case because once I step it down to the 2nd highest setting (24 bit, 96kHz) all the noise just disappeared. Nevertheless, I think your mileage may vary as I've read about other users changing to the highest setting to eliminate the noise. So if you happen to notice your machine sounding weird with occasional crackle and pop, try tweaking the settings mentioned above. Anyone of you uses the Shift-Del so often that you will instinctively press it when deleting files, just like me? Don't know about you guys, but I have been so habitual with Shift-Del, that sometimes it caused me problems because I might still need the file, and it is gone beyond recovery (from recycle bin, that is). This is where unerase/undelete tool like Recuva comes to the rescue! Those of you who had used Norton Unerase would be familiar with unerase/undelete tools. One of the drawback those days is that when you unerase a file, you will have to provide the first character of the file name. That is a nightmare for people who have just deleted a whole folder of files. Well, that is not the case now. Actually, I am not sure if it is advancement of the tool or because of file system change (FAT vs NTFS), as unerasing files is much easier. For example, using Recuva, you start off by specifying a drive or folder to scan. It will proceed to scan that destination and provide you with a list of files deleted, in full name. It will also provide the status of the file, whether it is recoverable or not. Tools like these definitely comes handy for people like me who will continue to use Shift-Del on a regular basis. With the advent of ultra portable machines and netbooks nowadays, more and more machines do not have built in DVD-ROM drives anymore. But as most of you would know, there are times when you need to load/install something from a CD/DVD disk, and without proper tools, it would be fairly troublesome. Enter Virtual CD/DVD Drive apps. These apps cheat the OS to believe that there is an actual drive on the system. Then you just make images of your discs and mount them in the simulated drives. Not only it is helpful for machines without CD/DVD-ROMs, it is also convenient (even if your machine have the drive) such that you don't have to always lug a bunch of discs around. Just make image copies of what you need and store them in your hard disk, and you can have them at your fingertips whenever needed. There are a variety of such applications out there, the more famous ones would be Alcohol 120%, CloneCD/CloneDVD, DaemonTools, PowerISO, UltraISO etc. Most of them are quite feature rich, allowing you to have multiple virtual drives, and some even allow you to create and/or edit images (ISO, BIN/CUE, DAA etc) from discs. You could go ahead and try any of the above mentioned apps, but today I'm going to introduce you something a little more special. It is called KernSafe TotalMounter. What sets this apart from the rest is it's ability to simulate a DVD-RW. Yup, while most of the apps mentioned above can simulate DVD-ROMs, this one can also simulate a DVD-RW. This comes in useful when you have apps that requires you to output data to DVDs. In such case, you just need to mount an empty image, then let your application write to the simulated drive as if there is a blank disc. In conclusion, this is somewhat of a niche application because nowadays, most installer supports boot/installation from USB thumbdrives. But it is still useful once in a while just to make life easier. This will be a short post. Recently I've discovered this cool site to listen to music online, it's called Musicovery. What's special about this site is that it allows you to select a particular mood, timeline range and genre, and it will randomly play music based on the profile specified. From a few of my posts previously, you would have known that I like portable apps a lot. In fact, not only apps, but I aim to ultimately avoid all the installation and set up processes, even for operating systems. After running through various counts of installation processes, from Windows variants (95, 98, ME, XP, 2000, 2003, 2008, Vista, 7) to Linux distros (Redhat, Suse, OpenBSD, Ubuntu), I wanted to find a way to make installing new systems easier and less time consuming. 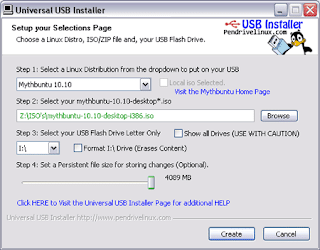 In the quest to achieve that, I came across this - Universal USB Installer. Mind you, it will not replace the installation process if you intend to install a new machine, but it allows you to create bootable USBs of selected Linux distros and boot from them. It is very useful for people who would like to do tests on brand new machines without needing to install or mess up the existing OS installations. It could also allow you to create bootable USBs of Vista or 7, though it will behave like the installation CD. You can't boot from them directly like what you could do with Linux. And of course, bear in mind that to create these USBs, you must have the installation disc or ISO images. If you would like do something similar (bootable USB/CD) for Windows, you could look into something called Preinstalled Environment (example: BartPE). I used to create bootable CDs with antivirus and diagnostic tools for testing purposes with BartPE, but have not used it for quite some time. Maybe I'll revisit BartPE one of these days and write a post about it. When you have more than one machine that you're using or managing, it becomes pretty tedious to be hopping from one machine to the other, especially when they are physically not next to each other. In fact, if you know any system administrators, most of them will swear by it that it makes their lives easier. There are many varieties of RDC software in the market, some are more well established than others, and some are chargeable while some are free. For me, I've always used a selected few depending on scenarios. The usual suspects are UltraVNC, Teamviewer, sometimes Webex, and occasionally Microsoft Terminal Services. For machines on intranet and those requiring frequent connections, I always prefer uVNC because it can run as a service and always ready for connection. It offers good performance and also supports display scaling and repeater functions etc. although I've never tried some of it (like repeater) yet. Best of all, it is open source and free. Of course, if you are mainly connecting to a bunch of Windows Servers, you could turn on Terminal Services on them to allow for RDC connection without installing any 3rd party applications. For machines that are on the internet, it would be more complicated if you want to use uVNC. You would need fixed IPs or some kind of dynamic DNS service to keep your IP address in sync. Otherwise you would not be able to locate your remote machine once the IP changes. Most of the time I use either Webex or Teamviewer in these scenarios. Both of them will automatically manage your IP address, and provides you with a reference number (Teamviewer) or reference link (Webex) to connect to. The good thing about Webex is you can schedule the meeting session to be active at a particular time (it was designed for web conference and web presentation), and the server can decide on who to grant control to. Also, it doesn't need any application installation, just some applet running on web browsers. But the free version only allow meetings to run a maximum of 24 hours each session. Therefore you need to have physical control of the server all the time. Teamviewer is very light weight and have options to run as is without installation (the downloaded EXE is about 4.5mb). You probably know by now I'm a big fan of portable apps as you can keep all these apps in a thumbdrive and bring them around. 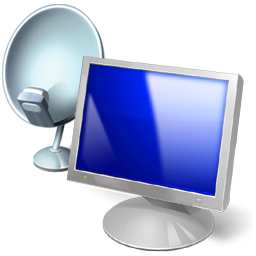 Teamviewer has options to setup for unattended access, which allows the server to be accessed anytime. Once the app is running, it will generate a unique ID and password for you. You can then share this info with anyone who needs to connect to your machine. If you've noticed, in my post about Image/Photo Resizer, I have mentioned about resolutions and megapixels. Then the previous post on Resolutions, I've touched on display resolutions. Are they different? No, they are the same. In fact, if you ever tried taking a 1.3MP picture and display it on a 17" (1280x1024) monitor, it will fit just about snugly on the screen at 100%. That is because 1280x1024=1,310,720 which is about 1.3 million pixels or megapixels (MP). 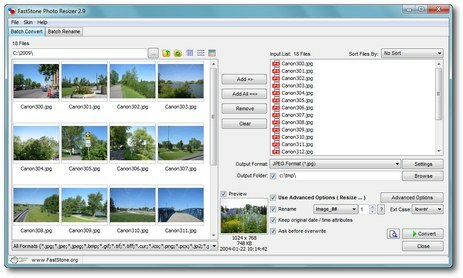 MP also determines the file size of your image, as it specifies how much details of a picture will be stored in the file. Therefore in Image/Photo Resizer, I have mentioned that lowering the resolutions will result in smaller files and in turn allows you to upload pictures faster. Of course, the side effect of lowering resolutions is that your image will lose some details and thus won't be as sharp as the original. So yeah, it's all about the megapixels. 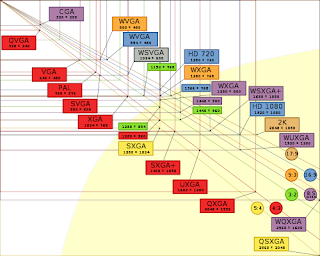 I've found a nifty little website called Megapixel Overview Chart that helps you to quickly calculate the megapixels and translate them to estimated file sizes. The site also have other handy tools like Bandwidth Calculator, Color Converter etc. No, this is not a post to talk about New Year resolutions, but rather, computer display resolutions. Recently a friend getting some inputs from me about the feasibility of getting a 32" LCD TV to double as a PC monitor, especially since the prices of 32-inchers have dipped to very affordable levels. So first think I asked him is, what was the main intention? He said that he have been using 2x 17" LCDs with a Matrox dual head card, and have enjoyed the extended real estate provided by 2x 1280x1024 pixels (effectively 2560x1024 pixels). This set up is especially useful for opening multiple applications. In fact, I do the same at home where I have my laptop extend it's screen to a 17" LCD monitor. To end this post, I'd like to add that despite what I've said above, it is still very much possible to get more display real estate with a single device. As you can see from the charts, there are devices out there capable of very high resolutions like WQXGA (2560x1600), which, naturally comes at a higher price. Image or Photo resizers are software tools that makes life much easier when you need to do bulk editing of pictures. For example, imagine that you went to a fabulous tourist attraction spot, and took an SD card full of pictures in 12 megapixel. Now each picture is going to be 4000x3000 pixels (assuming 4:3 form factor), and each file will take up an estimated space of 2.5MB. If you fill up a 4GB SD card, you are potentially looking at approximately 1600 images. If you are just going to load the pictures into your PC, that is fine. But, if you decided to share the pictures with your friends in Facebook, you're going to have some problems. It will not be practical to upload the full sized pictures as it will take quite some time to upload all 4GB of goodness. So what you can do is to resize the pictures to a reasonable size (say 800x600 or 0.5MP) for upload. Of course, you could fire up your faithful image editor like Photoshop, GIMP or MS Paint to do that, IF it was just a handful of them. But 1600 images? You have got to be kidding. One way of course is to have scripts to batch process it, if you're fluent with scripting on Photoshop, but here I'll recommend some software that will make your life easier. The first ever free image resizer I got introduced to is the "VSO Image Resizer". It does a brilliant job of batch converting images to the size that you want. And in addition, it lets you alter the EXIF data, add watermark and perform batch rename. One downside though is that it has an annoying pop up every time you launch the program until you buy and unlock it. Lately I've found another great resizing tool that's also free, called "FastStone Photo Resizer". It pretty much have all the features that VSO has, plus some more. And one thing I liked most about it is it has a portable setup option. I'm a big fan of portable apps as you can dump the whole app folder into a thumb drive and bring it around to be used on other machines without needing to run the whole set up process. And there you have it, Image/Photo Resizer apps that saves you tonnes of time and makes your life easier. The name "DYKT" was inspired by some threads during the days when I used to hang out a lot in forums. In order to increase post counts, some people will create a DYKT thread that everyone goes piling on with mostly nonsensical and useless facts, started with the sentence "Did you know that...". Initially I've created this blog to document interesting knowledge and discoveries that I happened to discover, but then I never got around to update it much. In addition to knowledge sharing, I will now rebrand this blog as a "recommend me" kind of blog too where I will evaluate, share, and recommend interesting tools, apps, gadgets etc. The content of this blog is solely from my point of view, opinion and experiences. Your mileage may vary.